Like most plant enthusiasts, I love to leaf through seed catalogs. My uncle even gave me a seed catalog for Christmas (for Landreth seed company, the oldest seed company in the US) and what a welcome and well thumbed gift it was. When I first started gardening, I’d try anything, and I was always seduced by the more exotic varieties. Years of failure and disappointment have modified my habits. I still like to try new things, but I like to get some sure bets in there too. This has meant taking into account the vagaries of our climate, like the unrelenting heat and lack of rain every summer. It has also been important for me to know myself as a gardener. I have the very best of intentions, but there are some things that I am not well suited to. I was looking through a seed catalog a little while back, trying to decide if I should give French beans a go. I love those skinny little beans, with their deep flavor. Then I read that they have to be harvested every day to catch them at their skinniest and tastiest and I had to admit to myself that I was probably not going to live up to the modest demands if the French bean. It had never actually occurred to me before this happened that the foliage of broccoli trees was actually flower buds. In retrospect I guess that should have been obvious. So I was not only horrified but also shocked to see the broccoli about to enter full bloom. 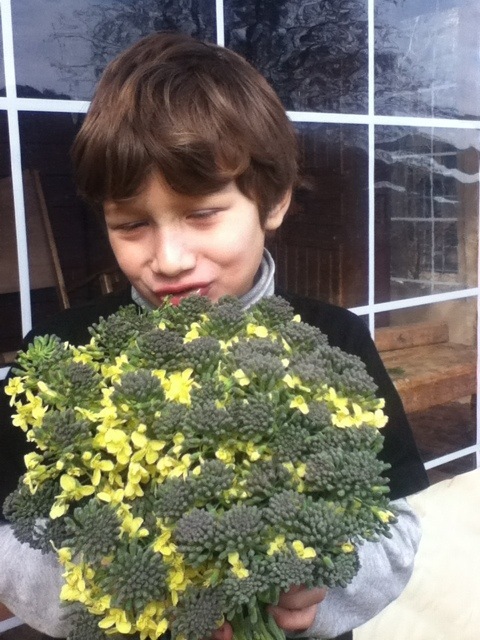 Still, if there is anyone else out there as negligent as me, don’t lose heart; the broccoli was absolutely delicious, flowers and all (Baki took a few big bites before handing over his bouquet). I’ll be sticking to runner beans and a few kinds of bush beans (edamame, black chickpea) this year. Don’t let the catalog description deter you from the French beans – they taste great, no matter if you pick every day, or every three days. I’ve had some ‘get away from me’ and turn into giants…those get tossed with oil, salt, and pepper, and roasted in the oven!